Phew! I'm running late! The trouble with weekends at this time of year is that there are just so many "end of year chores" to be done. I've spent all day in the garden, clearing up and doing an end of year prune of many of the shrubs. At the end of the day, I suddenly remembered that I haven't published my customary blog post! But, never one to disappoint, I have managed to produce a quick review of yet another Hanayama Puzzle from my latest batch from Puzzle Master. 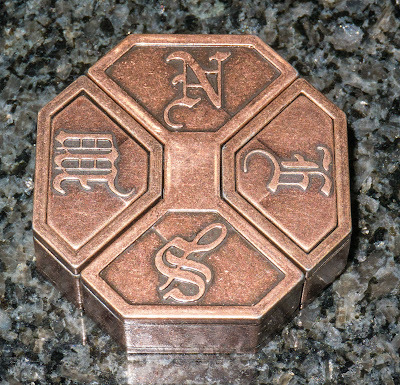 This time it's the Hanayama Cast News - I had saved this for a while because it is a level 6 on the Hanayama 6 point scale and was, therefore, supposed to be a real challenge (on the Puzzle Master scale it is said to be a level 10 - Mind Boggling). The puzzles at this level are supposed to be a tremendous challenge to newbies and even pretty tough for wizened old puzzlers like me - I can't believe I am calling myself that after just 4 years as a puzzle fiend! The reviews on the Puzzle Master product page for this are quite mixed with a few complaining that it was actually very easy! But the majority of reviews have been 3 stars and above (with an average of 4) and that was good enough for me to choose it. Plus I got it because this is it is the last one in the group of level 10 puzzles in my collection. Gabriel reviewed it here and really enjoyed it. This one arrived in the usual immaculate Hanayama box and was nicely wrapped. The instructions are simply to take it apart and put it back together again. 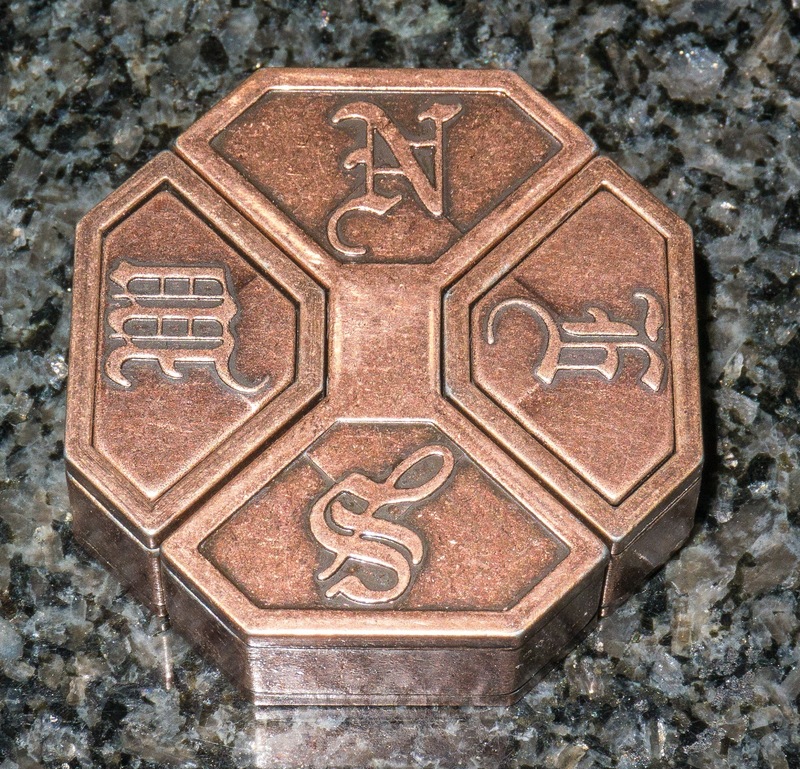 The box gives a little spiel from Nob Yashigara who designed it and quite a few other puzzles from Hanayama. Apparently the key word is "Needle"! I have no idea why they put that on the box because no-one pays any attention and it is not in the least bit helpful. There is no solution provided but if you find you need one then it can be downloaded from here. 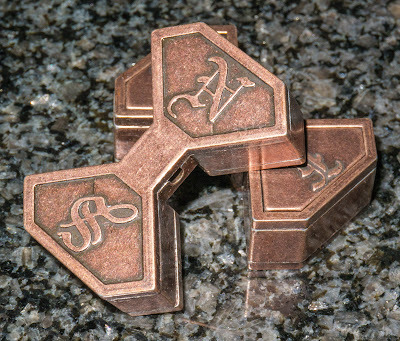 It's a lovely tactile thing made from a reddish antiqued brass and has a good weight to it. The N E W S is so named because of the points of the compass and looking at it, it is clear that it consists of 2 dumbbell shapes lying one atop the other. Pulling at them is obviously futile but I did it anyway and of course got nowhere! Now if you are relatively new to puzzles then you may well struggle for a while with this one but most experienced puzzlers will have seen something very similar before - or so they think! I rattled it and realised that the contents of the puzzle were a bit more involved than I was expecting - there appeared to be pieces moving around that I would not have expected to hear. During my induction into the world of the puzzle party I learned several of the tricks that can be used to solve puzzles and one of these tricks is the essential one for this (NO! I did not submerge it in water Allard!!!) But I did this very fancy and highly involved trick and promptly pulled at the pieces expecting them to come apart but it stayed firmly intact! Hmm! Maybe it needed more? So I repeated it several times and nope! No joy. At this point I held it up to the light hoping to see between the pieces and gained absolutely no information whatsoever. Bingo! We have 2 pieces! When it came to putting it back together, I discovered that there was a certain subtlety to it and then realised that this actually required a set sequence of movements to solve it. This explained the reviews in the website that said that a good number of people had solved it by accident. As I have said with several puzzles, it is not with the first opening or solving that the true understanding occurs. This puzzle is a bit more subtle than that obvious puzzler's trick. I can separate the pieces of this puzzle in just a few seconds with a specific sequence of moves and can guarantee it will work every time! This only comes from a true understanding. Do I recommend this puzzle? Yes! It should be part of every serious collection and is a good puzzle for experienced and newbie puzzlers alike. It's only $13 and so well worth an investmnet. While it took me quite a while to solve this one, the solution came to me out of frustration, not logic. I must have "accidentally" managed the first move before attempting the solution move because it came apart for me with only one attempt. Now that I've solved it once, it's no longer a puzzle to me. There is no replay value in this puzzle once it's been solved the first time. This is one of only two Hanayama puzzles that I own that continue to collect dust. For me, I solved it by trying something that is fairly standard but there is a little twist to it that wasn't immediately obvious. But I do agree that replay value is low. This is the case with a lot of puzzles and it is only when you have many many hundreds that you forget how even the easier ones work. Just bounce it off the floor a few times and it opens. What a rip off! It’s not a rip off for only $13! You should know better - no puzzle is supposed to be solved this way! You should be attempting to solve it properly! I freed my angel and I need her help! I'm a puzzler on the edge!